Skepsis » The Roswell Incident – the greatest mystery in UFO-logy? The Roswell Incident – the greatest mystery in UFO-logy? Article from a skeptical viewpoint on the socalled Roswell UFO crash. The conclusion is that it has been created through series of slight exaggerations, which turned a pretty ordinary matter into a big, modern, fairy tale. I started by reading through the online available testimonies, the USAF report and a GAO report, and continued by reading various other material, mostly available on the net. After I posted the 2nd revision to the Web, I have had several good discussions with both UFO-logists and other skeptics and most of them have been very rewarding. Though some points I made in the 2nd edition have been proven wrong, my overall picture of the event has been strengthened through these discussions. To leave no doubt, I might as well tell you from the start: I am a skeptic, and I feel the Roswell incident has been created through series of slight exaggerations, which turned a pretty ordinary matter into a big, modern, fairy tale. It is nearly impossible to gain insight into every claim made in this case, and admittedly, reading only online available accounts is not a complete overview of the case. However, all the most important witness accounts can be found (and are linked), and I believe I have got the main points. Further, there are many fantastic claims connected to this case, and dealing with them all would certainly be a full-time job. I have therefore concentrated of what the most sober UFO-logists would regard the Roswell Incident. Proceed with a critical mind. First, a few words about Roswell. Roswell is in New Mexico. The state is USA`s most secret, and has hosted many of USA`s most secret military projects. Around Roswell is for example White Sands, where the V2-missiles flew around in the air. But they were blown away long before they could reach Roswell. Also to be found, is Alamogordo, where the first nuclear bomb was exploded, and then Los Alamos, where they were developed. Then. there is a Air Force-base there, that were the first that had nuclear weapons. Apart from that, Roswell appears to be a peaceful, little spot (I haven’t been there…) in the desert in New Mexico. The crash we are talking about happened closer to a place called Corona, but it seems there were more action in Roswell. Major Jesse Marcel Sr. started it. And were also the one who started collecting debris from the crash-site. Sheridan Cavitt accompanied Jesse Marcel Sr. to the crash-site, and is the only living person who were there. And he says he recognized the debris as a weather-balloon of some sort at the site. Jesse Marcel Jr. is Sr.`s son. Says his father came home in the middle of the night very excited about the finding. Walter Haut was ordered to make a press release were they say they have recovered a flying saucer. F.B. does he call himself, and that doesn’t sound good to me, when everybody else is there with a full name. He is the only one in the testimony I have read that claims to have seen aliens. William Brazel Jr. Son of the rancher Mac Brazel who found the wreckages. Mac says the wreckage was much smaller than Marcel claims. Pappy Hendersons friends and relations. Pappy Henderson was a big-shot pilot during WWII, but were never interviewed himself. But some of his friends were: John Kromschroeder got to see a bit of debris in 1977. Irving Newton recognized the balloon as exactly a balloon at the first glance. 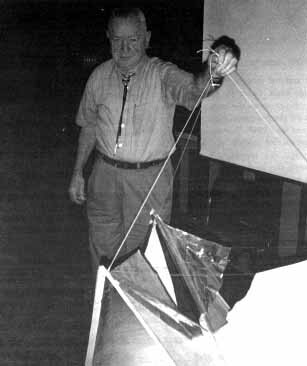 Charles B. Moore constructed the balloons in the Mogul-project. Glenn Dennis had a girlfriend who were nurse who were there when the aliens came in. Barbara Dugger grandchild of the sheriff in Roswell at the time. She says the aliens were alive. The greatest problem with this case is perhaps that the witnesses doesn’t agree with each other (and themselves) what fell down that night. First out is Jesse Marcel Sr. He says it was lot’s of debris scattered over a large area. Huge, in fact, 3/4-miles times several hundred feet. But Marcel doesn’t say anything about how the debris were distributed, something I would love to know. But Bill Rickett says that a Dr. Lincoln LaPaz, a physicist was called in to find the trajectory of the thing that crashed. The first thing I would do, is to get an impression of the densitydistributionfunction of the debris, but there is no telling of any such activity in the testimony. Strange, I think. Then a press release is released were they say they have found a flying saucer. Then the story is that the Air Force seals the area completely. After a couple of days, they find the main body of the UFO, 2-3 miles from the spot were the debris was. Another mile or so further, they find 3 or 4 aliens, one or more could be alive. Everything is carefully picked up under heavy security. But there is none in the testimony I`ve read that did that, but there is two hundred witnesses interviewed on the matter. The debris is flown to Wright Field. And somewhere is it denied that it was a flying saucer they had found. Nothing happens, The Roswell incident isn’t even mentioned. Then the Roswell case starts in 1977 or so, when the UFO-logist Stanton Friedman finds Jesse Marcel Sr. His testimony was recorded in 1979. Then many more comes. Lets start with the most dramatic, most sensational. The claim that there were a crash site 3-4 kilometers (2-3 miles) from the large debris site, and even further away, there were a number of humanoid bodies from another planet. Let’s assume that there were bodies. Now, the individuals in the testimony disagrees whether there were 3 or 4. Barbara Dugger, who is the granddaughter of George Wilcox, the sheriff, who was contacted by Mac Brazel when he found the wreck, even claims one of them were alive when they found it. That isn’t too bad, when the crash happened a week before they were found. The finding of the main body of the spacecraft was done by the military, and no civilians were allowed near. Not even the sheriff? Well, so they did really found the wreck of the main body and the aliens a week before. Why isn’t that the story Mac told his daughter? And the explosion prior to the crash was extremely violent. According to Major Marcel, the debris was scattered over a large area. Strange if anything could survive that… But of course, they are aliens. And what did they do to it? Did they kill it before the F.B, the star witness, saw it? Or is it still living in the US under cover? Though this Kaufmann, also said that: one were alive, but I haven’t got much confidence in him. No…. Then this film comes out. Allegedly, it shows an autopsy of an alien. Most people believe it seems like the film is a hoax. My pet theory was that it was a human with a rare disease, but earlier this year MSNBC reported that it was shown that several frames has been removed from the film. The alien autopsy is hardly worth further comment. So what have we got? Still the problem with the inconsistencies on how many they were. This wouldn’t have been significant if they weren’t so sure about it. But the aliens appearance are quite consistently described as smaller than us, big heads and such. Only one witness has seen it himself, claiming there were four. Of course, Glenn Dennis had spoken to a nurse who had been there examining them. She said one of them were in good shape, and that there were three bodies. I did some thinking about how the main body of the alien spacecraft got to the second site. I also talked to someone at the department of aviation medicine here. If the explosion were fairly symmetric, all pieces from the spacecraft would have the same speed relative to the center of the mass of the spacecraft that used to be. And the spacecraft were moving with a velocity in one direction itself. Now, if the main body of the spacecraft didn’t have any kind of propulsion itself, it would not have come anywhere beyond any of the other pieces of the debris. It would have landed on the outskirts of the debris site. Now, there is a serious problem about this resonnement: Some light material would be easily stopped by air-resistance, but the heavier main body wouldn’t. Especially, if the explosion happened high in the air, this would be significant. However, if are to believe Bill Rickett and Lincoln LaPaz (which we are not, but for the sake of the argument), it didn’t, and therefore, I have a problem with this. One might conjecture that they ejected. Or rather the main body ejected from the rest of the spacecraft itself because they were warned that they spacecraft would explode. Of course, the point with an ejection mechanism is to save the pilots lives. Therefore, they shouldn’t have died if it was like this, consistent with Barbara Duggers testimony. But did the ejection-mechanism have a very clever design? If you see that you’re about to drive into a wall, you wouldn’t step on the gas and turn the turbo on, would you? You would brake as much as you could to make the impact less severe! Well, perhaps they didn’t step on the gas, but they certainly didn’t hit the brakes. If they did, they would have landed in the debris area, or close by. The point with a ejection mechanism must be to take the pilot away from the exploding aircraft, and then reduce his speed to a minimum, and thirdly let him land as soft as possible on the ground. The first action gives the pilot a little higher speed. There has been done experiments with mechanisms that would make the ejection upwards independent of the direction of the plane. There has not been any great successes, but it isn’t far away in time. The braking. The air pressure does that bit, and that’s some brake! And then to land softly, parachute. It doesn’t seem to me the ejection of our friends the aliens was designed that way. They traveled along at the speed they had at the moment the ship exploded, and fell to ground, quite sure of getting killed. That isn’t the ejection-mechanism of an extremely advanced civilization! I really planned to dismiss the finding of the alien bodies as just a good story evolving after (and maybe a little before) Marcel got out with his story. A result of small-town talk. I’m sure there are large numbers of such stories around. But then, this F.B.-person in and is not from this town. That makes it difficult. He is the one who says he saw four bodies. And he’s the only one in the testimony who saw it himself. And just as the flash of his camera went off. The rest of the witnesses talking about aliens are second or third hand information. Like: «Dad told me stories about it when I was a kid», or «somebody told me» or «She told me about them to me», or something like that. Why is F.B. only mentioned by his initials? Of course, he was threatened like the others. I guess his an old man now. No job to loose. But they could hurt him if they knew his name. There were not many photographers around. And surely, they are mentioned in the records. If somebody wanted to, they would easily find out who he was, and get to him anyway. I can see no reason for him to be anonymous. I mean, if «they» would get him, they wouldn’t need his name, would they? And he is the only one in the testimony I’ve read that is, and he is also the one who is destroying my picture. Most of the witnesses doesn’t say anything about it. I even read in some article that Major Marcel thought there were no bodies. But the testimony I’ve read does simply not mention it. Wouldn’t it be a natural question to ask those who was connected? Or was it something that wouldn’t fit in? All right, I’m on thin ice, but I’m not accepting this with the alien bodies at all. I feel I can do so as long as the evidence is so poor. They have to come up with better evidence than this. Was it really a second crash site? What do the witnesses say about the second crash site? Well, there is none of that witnesses that were there. Nobody has seen the second crash-site. Nobody has seen anything been taken away. No wonder really. The area was completely and efficiently sealed by the military. There must a have been a large force out there to do the job. There is one witness, Beverly Bean. When she was a little girl, her Dad used to tell her stories about men from outer space. He had been on a truck driving from the crash site. This account is second hand. It’s told to a little girl. We can’t let this be too significant. Stories often get confused when you’re small, you know. And those who initiated this story, tells of no such thing as a second site. Not Major Marcel, not Mac Brazel. In the light of the discussion I had on how the main body of the spacecraft must have gotten there, by an ejection that would be so strange to make that an intelligent civilization wouldn’t do that. Definitively not a civilization so advanced it is able to cross the vast distances between the stars. And in the light of no testimonies from the site, and absolutely no physical evidence: No, I don’t buy it! That leaves us with the first debris site. I bet it was strange enough for those who found it, but the great question is: Is it something made on earth, or something completely different. As I wrote before, two persons went out there to see what the rancher Mac Brazel had found: Jesse Marcel Sr. and Sheridan Cavitt. They went through the debris together, and it is reasonable to assume that they talked about what they had found. Sheridan Cavitt says he recognized it as some kind of balloon, Marcel says he understood it wasn’t some kind of balloon. Wait a minute, Marcel says somewhere he didn’t understand what it was until later. Wait a minute, Marcels son says his father came home in the middle of the night waking his mother and him, excited of what he had found, and wanted to show them. Wait a minute, he couldn’t have been that excited about it, because he didn’t care to go to the crash-site once more to take a closer look, because he had so much work to do at the office. To be more clear, Marcel says it took some time before he understood what it was. So the big question is: «How long did it take?» Clearly, he must have understood it by the time he got home, because he bothered to wake his son and his wife. But on the other hand, he didn’t have the curiosity to go back. According to his testimony, it was because he had too much work to do at the office. UFO-logists argue it was because he was ordered not to, but he didn’t say that, he says it was because of some trivial work. It is strange what the son testifies. If his father did understand this was something extraterrestrial, so that he wakes up child and wife, the discovery of the millennium, he would of course taken time to look at it again. Human curiosity is what has brought mankind to what we have today. It makes us climb the highest mountains, explore space, and invent new technology. It makes us risk our lives just to find out strange things. I just saw a program about a anthropologist who visited a people in the jungle that had never seen a white man before. They filmed them as this white anthropologist approached, and you could see the native warriors were scared to death. But they curiosity took completely over after a while. This was the extent of human curiosity, and if there has been alien visitations, it should have been proven a long time ago if any of the witnesses had exhibited one tenth of normal human curiosity. Marcel has realized he has discovered evidence for alien visitations, the discovery of the millienum, but he doesn’t have a human curiosity, a curiosity that would have compelled him to investigate further, even under threats. There is something strange about Major Marcels testimony. Now and then, there are tiny exaggerations made over short periods of time: First, he says explicity that he didn’t see anybody try to make a dent in the debris, he just heard it. But then he says: «We even tried making a dent in it with a 16-pound sledge hammer, still no dent in it.» UFO-logists that have followed this case for a long time argues that they never noticed any significant change in Parcels testimony. Well, you don’t notice that your blue jeans is getting lighter, even though you wear them every day. It comes as no surprise that no change has been noticed, because it occurs in only small portions at a time. And that such small changes has occured, I have just demonstrated. In his testimony, he says that is wouldn’t burn at all. On another occasions he has allegedly said: «It didn’t burn very well«. There isn’t much difference here, but with a few changes like that, and you’ll have an entirely different story over 40 years than what he really saw. People saw unrecognizable symbols on the debris. If I was up to something secret, I wouldn’t use recognizable symbols. John Kromschroeder was shown a piece of the debris in 1977 by Pappy Henderson. Robert Smith claims he saw one of people there put debris in his pocket while loading the debris onto the planes. And from the criticism of the AF report it seems that Marcel kept pieces of the debris. It should be a pretty easy task to trace this debris. And just a tiny fragment could be enough to prove its alien origin, there are several tests that could be made. This doesn’t fit very well with Marcels testimony. Marcel claims the extend of the area to be as large as «three quarters of a mile». It is not at all what is described above. It sounds like most of it was already picked up by Mac Brazel. BTW, according to Charles B. Moore, a prize of $3000 had been put out for the first who could provide a piece of an alien space-ship. Guess what, a few weeks before «The Roswell Incident», Mac Brazel claimed the prize. Without having sufficient proof for it’s alien origin, of course. It is time to emphasize a point: I am not saying Marcel is lying. There is no need to make such an accusation in this case. A common error among UFO-logists (exhibited to a great extend in the critique of the AF report) is to view a testimony that has not been completely discredited as Gospel Truth. On the other hand, my fellow skeptics has occasionally dismissed an entire testimony because they have demonstrated some minor inconsistency. I choose a middle path: Every testimony must be regarded as an approximation to the truth. Unless the person is being deliberately deceptive, there is some truth in what he is saying, but it is probably not completely true, and cannot be regarded a fact. Bill Rickett testifies that he guided an astrophysicist call Lincoln LaPaz to the site. He says LaPaz went around talking to people, about animals acting strange and so on. I am myself an astrophysics-student, and what Rickett testifies doesn’t sound like the work of a physicist at all. A physicists work would be to check for physical traces. He would find out how the debris where distributed, and from that there are lots of calculations that could be made. There are three possibilties: Either Rickett misinterpreted LaPaz activities grossly. Or LaPaz might be a quack. I found him to be quite a lot involved in rather curious UFO research, but I decided to check the Science Citation Index, and found he had indeed made som influencial contributions. He wasn’t a quack. The final option, well, we have only Ricketts testimony that LaPaz was on the site… Maybe he wasn’t. As we have seen, an average of the testimonies we have would give us a much smaller debris area than Marcel alone wants us to believe. Some facts doesn’t fit to good with Marcel picture of an alien spaceship. But it isn’t to bad with Project Mogul. Project Mogul – a secret balloon. Charles B. Moore constructed balloons that were to be used in detecting expected Soviet nuclear bombs-tests one in 1947 soon expected. They didn’t have many options, and large balloons with among other things radar reflectors were chosen for the task. Of course, it is controversial, and some points UFO-logists make against this explanation is truly not easy to answer. However, I feel the AF is onto something that fits the extend and the appearance of the debris pretty good. Of course, an alien explanation may be fit to anything, but that doesn’t mean it is a good explanation. I have no urge to defend the Mogul story at any prize, but it clearly deserves a more unbiased view than UFO-logy has given it so far. After all, it is not the only similar project that was going on at that time. The largest balloon-trains were large: «Up to two dozen neoprene-balloons with a total length of up to 600 feet.» Not all of the balloons were that large, and they were not large enough anyway to produce the amount of debris Marcel told about. This was the UFO-logists criticism against Moore: A few years ago they asked Moore if the Mogul-balloons could have been what Marcel told about. And Moore replied of course that it couldn’t have been. I mean, if UFO-logists ask you whether your stuff could produce 3/4 of a mile of debris, and it wasn’t that large, naturally you would say no. But as we have seen, the debris field was probably far from that large, and when other characteristics are mentioned, that might help you to remember. Take the middle path; look upon Marcels statements not as the complete truths, but as a product of changes in Marcels mind over time, then it seems as Marcel is describing a Mogul-balloon. And the description several witnesses gave of the debris, is pretty consistent with the radar reflector the AF says it was. Some UFO-logists argue that because Marcel was an intelligence officer, he should have been informed of project intended to survey Russian bomb test, and therefore, he should know about Mogul. It is reasonable to assume there were lots of different projects, Mogul was a project that failed, no wonder he never heard about it. Then, every flight in the Project Mogul was examined, especially those flights that they lost control over. One found out that flight #4 was the most probable candidate for the debris at Corona. Then the weather data from the time was examined, and they found that flight #4 would have gone that way. Of course, UFO-logists have criticized this report, and I have read some of this criticism. One thing they say, is that this flight 4 the air force says it was, wasn’t recorded. But other unsuccessful flights were. It is indeed a mistake, and the mistake was made by Moore, and he has admitted it. If others involved in this case had been as willing to admit their mistake as Moore, the case would have been closed long ago. I have at places in this article refered to objections commonly encountered when discussing with UFO-logists. I wrote the second revision of this article mainly for those who have had only a superficial encounter with Roswell before. Now, I have realized that to meet common arguments made by UFO-logists, I would have to assume to the reader some knowledge. I hope this assumption has not made the article considerable harder to read. First, a objection that has caused many UFOlogists to reject Moores statement altogether, is his admitted mistake. Then, they say it discredits Moore that he first said it couldn’t have been their balloon, and then turns around and says it was his balloon. As I said, that is not at all strange. UFOlogists asked of course the wrong questions! It is also a similar objection they have towards Sheridan Cavitt. Early, Cavitt claimed there was nothing, then he just wasn’t involved. Then he admits that he and Marcel was on the crash-site. This sounds odd, doesn’t it? Well, if you were out picking up some strange balloon at a ranchers house, collected some scrap in the desert, went home and never thought about. Then somebody knocks on your door asking: «You were involved in the recovery of a crashed flying saucer that covered 3/4 of a mile in the desert, weren’t you?», you would probably go «What? No, never heard about it.» And when the same people comes back again and again, sticking a camera in your face, showing you some records «This was flown out», you might go: «I didn’t fly». A online UFOlogists I discussed with held the above opinion, and had seen such an filmed interview, and when I asked, he said that it was indeed possible Cavitt just didn’t remember. I would love to see these interviews myself. Naturally, when Cavitt was reminded by the AF; balloon-kind-of-thing, not as large a debris site, visit to Brazel, it would of course make a lot more sense to him. Both Marcel and Colonel Blanchard who ordered the press-release about the flying disc being found, made good careers after the incident. Would they have had such great careers if the release was a mistake? Shouldn’t there have been reprimands in the archives? This is claimed to be a problem, but it is a problem independent of if it was a real UFO-crash or not for the following reason: If they was to cover up alien crashes (for their technology or something), they wouldn’t have a chance of covering it up if it wasn’t a policy they had. At some point, they must have realized there were alien activity, and Roswell isn’t the first case, there were many rumors going around. So at the time, they must have decided that such incidents should be kept a secret. So some people must have been involved in covering things up. But they couldn’t inform every colonel, or every major about «Any sign of alien activity should be kept secret», then it would have leaked quite soon. They must have told everybody that certain things should be reported to higher headquarters before anything is said. My point is that the lack of reprimands is equally strange independent of whether it was a saucer or a Mogul-balloon. If Blanchard knew aliens was to be secret, he certainly blew it, and if he should have reported it for it to be covered up, he blew it as well. They might also say that Cavitt, if he knew it was a balloon kind of thing, he would have rushed to save Blanchard some embarrassment. My theory is that Cavitt by that time had no interest in the case. He proceeded with his daily work, and didn’t know. If it was ordinary, he wouldn’t say anything. If it was very extraordinary he would. You don’t go around remembering ordinary things. And that’s a major point here: To Cavitt, it wasn’t extraordinary enough to be remembered. As we are talking about archives, UFOlogists thinks it is strange there are no archives about anything. It may be strange, but I think they are exaggerating its importance. It is only natural to clean things up and get rid of old things once in a while. Admittedly, I don’t know much about AF filing routines, but it doesn’t seem strange to me that they disposed Mogul records, the project had failed! There were nothing of interest there. And why wasn’t Charles Moore informed of the recovery of one of his balloons? Well, they expected some of their balloons to get lost. When you launch a balloon, you can’t control it, so that a balloon gets lost is no surprise. The most plausible answer is either way that it wasn’t important to send it back. First and foremost, we have the so-called Majestic Twelve-documents (MJ-12). They are a proven hoax, though much of the UFO community still promotes them as genuine. Not long ago, the Twining and Schulgen memos surfaced, allegedly they were authentic documents, from the US National Archives. But they have an extremely bad smell to them. The Schlygen memo sounds like very bad science-fiction. It describes some properties with something it is suggested is an alien spacaship, and it says it has some kind of a nuclear reactor as propulsion. But how would the author have any idea of how a to describe such an reactor? This was written in 1947! It is typical for sci-fi-authors to take the newest discoveries, the first controlled self-sustained nuclear fission was achieved on 2. decemeber 1942. But fission isn’t a very probable source for interplanetary travel, it is a energy source we now know as hour palms, you would need fusion. Only today, we are getting a fair idea in the direction of how a fusion reactor could look like. And if he understood so much of the fusion-reactor, it would certainly have been in commercial use long ago. It may take a few decades before we get it running. On these grounds I’m reluctant to accept them as evidence until more evidence with regard to their authenticity is provided. One thing about the testimony is that everybody claims to remember things so very well. The UFO-logists criticize the air-force that their witnesses doesn’t remember the events well. After 40-50 years I think that is perfectly natural. In fact, that the UFO-logists witnesses have such clear memories makes them less credible, I think. In the analysis of the report internal inconsistencies, they are not at all looking at what the internal inconsistencies are, they are not at all looking at at the report standing alone, they are looking at it in the light of the other testimonies assuming they are the gospel truth, or they are blaming the witnesses for not remembering correctly after all these years. Good stories have their own dynamic. You know how jokes evolve. We have all heard jokes in one form told by someone, and in a slightly different form by some other person. All testimonies must be regarded as interpretations of what one has seen or heard or maybe approximations to the truth. «Hey you should have seen that fish! It was at least 6 feet long! I struggled and struggled for hours I was about to win and as I said it was at least 6 feet between the eyes! People might have seen the same things, but tell different stories. So, in general, I’m not accusing anybody of lying. There is no need to be lying to come up with a story like this. It’s perfectly human. You see an event, you think it is kind of strange. You forget about it for some years. Then someone comes around wanting to hear what you have to say. Meanwhile the story has been growing in your head. You think you have seen things that wasn’t really like that. Big things become bigger, small things smaller. Strange things stranger. Things that wouldn’t burn very well becomes fire-resistant. Just a few things like that, and you’ve got an incredible story. In the testimony, the only piece that was presumably recorded just after the incident describes something that well could be a weather-balloon. And it was a large balloon. The rest of it has change due to the dynamics of a good story. Another description of what it was appears in App II of the GAO-report. This is an FBI-document from the time, describing what it was, and what was done to stop the story. There is not enough evidence to say there were alien bodies aboard a crashed craft. There is not any evidence that there were a second crash site, where the alien bodies were supposed to be. Marcels testimony in particular, indicates there were a crash site, where debris, not familiar to him, were scattered over a large area. The press release from the time saying they recovered a flying saucer, is consistent with the story that it was a weather balloon. This press release, and Mac Brazels interview indicates the debris site was much smaller then Marcel suggests. The witnesses description of the debris is consistent with the materials used for project mogul. I suppose that debris from the crash would be easy to find if it was scattered over a large area, like the testimony suggests. Marcel is changing his testimony slightly over a short period. This could indicate he is exaggerating. The most difficult point is that Cavitt and Marcel was on the site together, but doesn’t agree on what it was. Cavitt says he recognized the wreckage, Marcel says it was something strange. The fact that Marcel didn’t go back there indicates it was not as fantastic like he claims. The testimonies I’ve read has been biased as they were recorded. To have an more unbiased testimony, one should record the questions as they were asked, and the answers as they were told, letter by letter. Otherwise, the investigator would interpret his findings as they are recorded in the light of his existing image, which is not good science. Most of the witnesses say nothing about alien bodies or a second crash site. There should be a natural question to ask the rest of the witnesses, like Jesse Marcel sr. Perhaps the question was asked, but the answer has been omitted in order not to destroy the myth. This article was accompanied by a long list of references when it was first published. Unfortunately, very few of these are at the same address anymore, and have thus been removed.